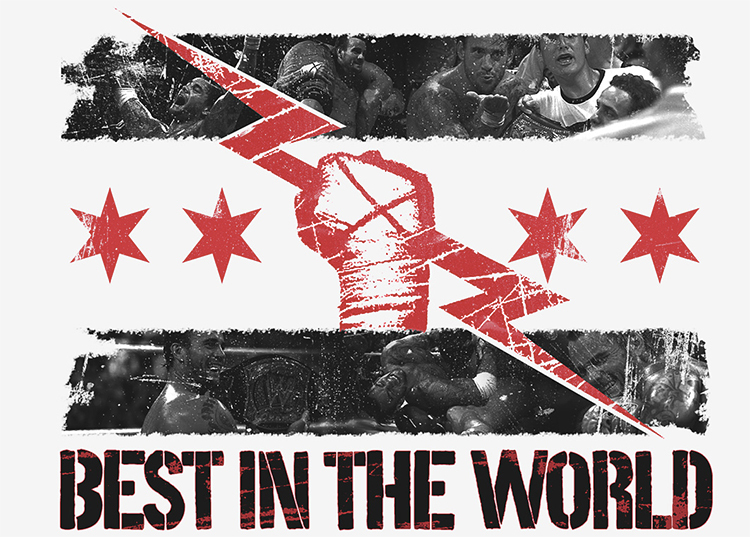 How Do You Get to be the Best in the World? Happy Thanksgiving from Top Level Podcast! In this very different episode Michael and Patrick trade a combination of old (even apocryphal) stories that have shaped their perspectives as players and thinkers. There exists a noteworthy playtest technique that Mike once swore by. It isn’t for everyone… But it was — at least in the story that converted Mike — used by the best player in the world at the time. Sometimes you have a 10% Game One matchup. Consequently you have to jam 8/15 sideboard cards in for a common opponent. Knowing this, just how often do you have to win to make up for that bad Game One? In smaller formats you can sometimes make your main good against Rock and Paper, and use your sideboard to shore up Scissors. We discuss a variety of of sideboard strategies from historical, successful, decks. Say I told you Canopy Spider is better than Bottle Gnomes against Jackal Pup… Could you tell me why? Esper Charm is super flexible. One mode allows you to destroy an enchantment. Why might you ignore that “Get Out of Jail Free” card against onetime boogeyman Bitterblossom? Hint: It wasn’t all that free. Dark Confidant. Bob. The Great One. Almost universally acknowledged as one of the best two drops of all time. But Mike tends to let Bob live. We discuss different ways to approach removing a Dark Confidant. Patrick has a wonderful, if non-intuitive, strategy around hand destruction when playing against Bob. “I have made a terrible mistake.” Mis-judging the opponent’s archetype based on which lands they play can be a killer. Mike and Patrick share sad and happy war stories, respectively. Can you beat a guy with seven Counterspells in his hand? Okay… So part of this is just Tom Ross. How is Tom Ross a real person / Magic: The Gathering player? Tom’s reaction to Blood Moon winning Grand Prix Dallas was to play an even slower deck that relied on not just nonbasic lands… But getting three particular nonbasic lands onto the battlefield! Part of it is that Tom correctly assessed that people would prepare for Blood Moon decks, maybe making decks good against anti-Blood Moon decks that much better. It turned out he was right! The main [deck] reason to play green-white UrzaTron instead of the more traditional green-red build is Path to Exile. That is, Tom played Path to Exile over Pyroclasm in the starting sixty. Three copies of a spot removal card is hardly the whole point, though. Not only does the Tron deck manage Path to Exile better than almost any other deck (who cares if the opponent gets one extra basic land when you are tapping yours for three? ), it makes much better use of the white mana… Just elsewhere. Rest in Peace – Tom’s sideboard featured Rest in Peace, a powerful supplement to the main deck’s Relic of Progenitus and another great spell against Dredge. Blessed Alliance – Blessed Alliance is a really flexible card here that really blunts the advantage Burn decks have often had against Ramp ones. Blessed Alliance doesn’t just counter a Boros Charm, it can surprise the opponent with a Wurmcoil Engine or smite a Tarmogoyf. The natural one-two-three is Urza’s Tower, Urza’s Power Plant, and Urza’s Mine in some order. 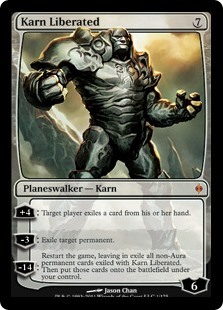 That allows you to tap for seven mana with just three lands, or the cost of a Karn Liberated. On eight mana you get Ugin, the Spirit Dragon and ten mana gives you Ulamog, the Ceaseless Hunger. Seemingly every play from there allows you to go “over the top” of a fair opponent’s game plan. It’s just about hitting your lands, and then landing almost any hitter to win. There are a ton of direct answers to Blood Moon in Tom’s deck, incidentally… Karn can remove a Blood Moon from the battlefield, as can either Ugin or Ulamog. Casting those cards might be tough under a Blood Moon, though (and World Breaker might be even tougher with its colored mana in seven). However Oblivion Ring costs just three mana to start. If Tom is not under substantial life points pressure, he can work an Oblivion Ring to really asymmetrical advantage. It can free up his lands from under Blood Moon easily, regardless. The deck has a good number of answers to obvious threats and strategies. Main deck Relic of Progenitus can give Dredge fits, while Spellskite will have an Infect player’s head scratching. Tom’s deck isn’t necessarily about locking out a game forever… Some of these tools are just there to buy time; remember – given a window to make a play, it’s unlikely there is one on the other side of the table better than one of Tom’s. 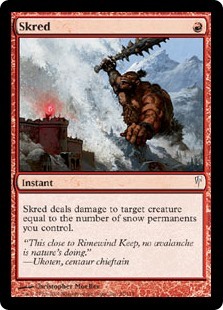 Is Skred Red a Prison Deck? When recording this episode, Patrick and Mike didn’t even know Skred Red was going to win the GP. Before we start, Top Level Podcast needs a favor! Patrick is in NYC this week, so the Top Level Podcast boys have the rare opportunity to podcast IRL, sitting next to one another. For our (almost) two year anniversary, Chapin and Flores chat about the Grand Prix Dallas Modern Top 8 as it happens. Spoilers! They don’t know who wins (yet). Patrick loves Grixis (surprise surprise); Mike cheers for longtime friend Phil Napoli (to no avail); and both love-hate the Skred Red deck [that ends up winning it all]. So how about those twenty Snow-Covered Mountains? Kevin Mackie’s Skred Red deck is ultimately a really nicely positioned metagame deck. Going into Grand Prix Dallas, Dredge was considered one of the top decks. What was Mackie’s response? Four — count ’em four — copies of Relic of Progenitus main. How do you like that, Dredge opponent? Well even if Dredge manages to go off prior to (or through) a Relic of Progenitus, he has Anger of the Gods main, too! Anger of the Gods exiles creatures as it sweeps them. That means that no matter how many Prized Amalgams you get, Mackie’s sorcery kills them all, dead, forever. Exile! The combination of Relic of Progenitus and Anger of the Gods really suppress the Dredge deck’s plan. But what about people who actually want to cast their cards? Mackie has Blood Moon for them! Spoilers! Mike doesn’t know what Eternal Scourge does. Aside from the Prison-esque elements, Mackie innovates the Skred Red archetype by adding Eternal Scourge. Not only is Eternal Scourge great against point removal (you can almost always buy it back easily), you can “make your own Call of the Herd”. Like, imagine your Eternal Scourge dies in combat rather than being exiled by being targeted by removal… The fact that this deck plays Relic of Progenitus means Mackie can set it up to buy back even when it goes to the graveyard per normal! The card is actually just great against almost anything that relies on point removal to control the board. A Blood Moon board control deck will often play many, many turns. Eternal Scourge helps Skred Red stall into those long games and gives it a reasonably large — even inevitable — threat that can actually win the game, given sufficient time. Should Verdurous Gearhulk unseat Ishkanah, Grafwidow at the Delirium five? One of the three principal decks of Kaladesh Standard is B/G Delirium. There are at least two versions: Although they have a fair number of cards in common — Traverse the Ulvenwald; Grasp of Darkness; or Liliana, the Last Hope — the two builds have very different strategies and play patterns, and try to accomplish different things. The incumbent version is more midrange. It is more likely to play both offense and defense at the same time with Sylvan Advocate. It might block with Ishkanah, Grafwidow in order to buy time to find a bullet Emrakul, the Promised End. The newer version — tracing back to Eric Froehlich at Pro Tour Kaladesh — is more offensive. It plays Servant of the Conduit to get the jump on the opponent and is more likely to buff with Blossoming Defense than trade one-for-one with removal or disruption (though it might). Ishkanah, Grafwidow is a powerful card. We’ve seen it played in Temur decks that could never tap for black mana! If you want to play a card that will help lock down the battlefield, there are few better options in Standard. Given time, it can cut down the opponent’s life total without having to risk combmat. Because it has reach, Ishkanah can help contain cards like Spell Queller or Archangel Avacyn. Because it has so many bodies, Ishkanah can act as a “go wide” stop sign to buy vital setup and stabilization time against beatdown. 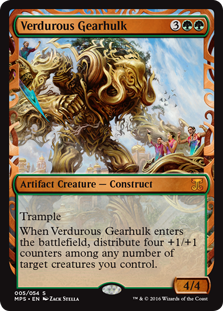 If you want to race or brawl, choose Verdurous Gearhulk. In the right context, Verdurous Gearhulk simply out-classes Ishkanah heads up. It will often be competitive (especially depending on what creature gets +1/+1 counters) but is always better when the opponent doesn’t yet have Delirium. Here, Servant of the Conduit and Catacomb Sifter help cast the Gearhulk ahead of time, and something to attack with. Traverse the Ulvenwald is one of the most flexible cards in Standard. It is generally great for fixing your land draw on turn one, but cashing in for a real threat later in the game. Traverse the Ulvenwald is so effective for its cost it has even started to see adoption in Modern creature decks! In the traditional Delirium strategies, you could Traverse on turn one (and the mana bases deliberately accommodate for having an extra few lands by playing only 23)… But once you have Delirium it can get an Ishkanah late, or a [generally singleton] Noxious Gearhulk as a point removal-type answer, or go super big with Emrakul. In the EFro version, though, Traverse the Ulvenwald is more a way to get Delirium! The aggro version simply doesn’t have many sorceries, so a cheap [one mana] way to get a sorcery into the graveyard puts the deck 25% of the way to its namesake. Traverse the Ulvenwald is therefore generally less powerful and flexible in the aggro version of Delirium, but that might make sense, given that the games are shorter by design.